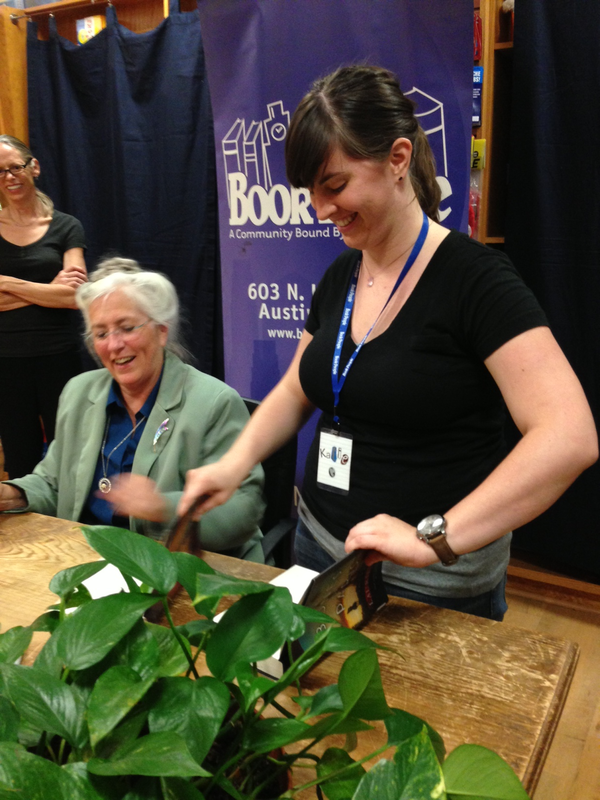 BookPeople in Austin, Texas, always has an impressive schedule of author events on the calendar, so it can be difficult to decide which ones to attend. When Laurie R. King’s name appeared on the roster, I cleared my schedule for that evening (well, after hustling kids to soccer practice, helping with homework, cooking dinner, you get the idea) and made my way to Lamar Blvd. I had the pleasure of meeting Laurie at this year’s Malice Domestic conference in Maryland. She was funny and kind and extremely gracious with her time. As the conference’s chosen Guest of Honor for Malice Domestic 2013, she still found a way to make time for every person hoping for a moment of her attention. There are few things more wonderful than realizing a favorite author is also a gem of a human being. 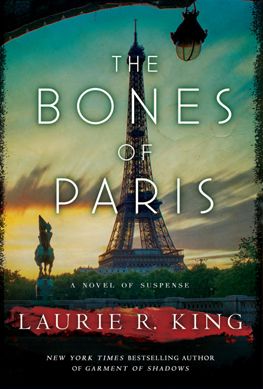 The Bones of Paris received a starred review from Booklist and Publisher’s weekly was equally kind with its praise. Exploring the dark underbelly of Paris’ Jazz Age through the eyes of Harris Stuyvesant will have readers up all night in anticipation of what he discovers next. While Mary Russell remains a crowd favorite, it’s clear that Harris Stuyvesant will garner loyal readers as well. After all, there’s room on our nightstands for more than one compelling King protagonist. When asked by an audience member how she was able to juggle writing multiple series, she answered that she found herself easily bored and preferred switching from one project to an entirely different one. Loyal King readers are thankful for this view as it gives us a broader range of stories from which to choose and affords us the opportunity to experience King’s storytelling prowess in numerous ways. Laurie can’t speak in public without someone asking her about her decision to take on the character of Sherlock Holmes through her vision with Mary Russell. She confesses that early on, she was surprised by the uproar from some Holmes fans. She says that one message board started flaming her on the Internet, back in the early days of such boards, but that she wasn’t on the Internet so all their disparaging efforts went on without her knowledge, something that still brings a smile to her face. “They were getting all worked up and I had no idea for the longest time,” she says with a grin. In truth, she was fascinated by the idea of taking many of Holmes’ traits and seeing how they would manifest in a young, intelligent woman who would stand as his peer. She was interested in “how it would be the same and how it would be different.” Needless to say, the success of The Beekeeper’s Apprentice captured the imagination of those who loved Sherlock Holmes as well as those who loved the idea that she would take the character and explore him through more current times and with compelling twists on the classic detective. One question that often comes up at such events–from curious writers– involves the debate between being an ‘outliner’ or ‘pantser,’ which has since evolved into the ‘organized vs. organic debate.’ Want to know under which camp Laurie King falls? While she does take notes on certain scenes or particular characters, Laurie finds it best to write organically. In fact, she co-authored a book with Michelle Spring titled the Arvon Book of Crime and Thriller Writing, which details the two authors’ differing approaches to crafting a novel. She says her first drafts are often “300 page outlines with characters disappearing and such.” Struggling novice novelists will be grateful to hear that someone with King’s writing chops turns out a less than perfect first draft. She does write 1,500-2,000 words per day until she hits a slowing point, which signals that she has more ‘back of the mind’ work to do in figuring out what happens next in the story. She finds it best not to continue to force the writing and uses the slowed pace as a signal that more questions need to be answered before continuing. When asked which authors she currently enjoys reading, King offers up Lyndsay Faye. “She’s such a talented writer. I loved the Gods of Gotham.” She also gives kind mention to Tony Broadbent, author of the Smoke series featuring Jethro, a jewel thief and cat burglar. King is hard at work on her next projects and promises that we will see more of Mary Russell in the future as well as other characters that have captured her imagination (and ours). King readers can rest assured that whatever the author brings next, it will be well worth the wait. 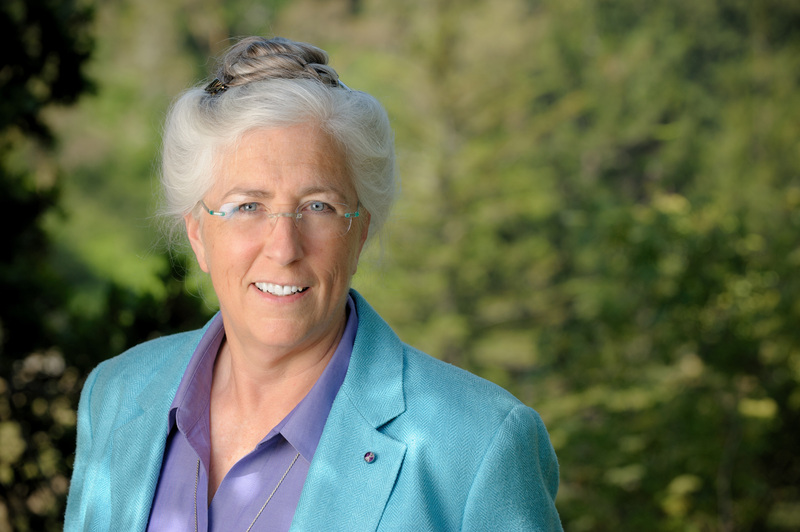 To learn more about Laurie R. King, visit www.laurierking.com. ← Welcome to Austin Mystery Writers 2014!